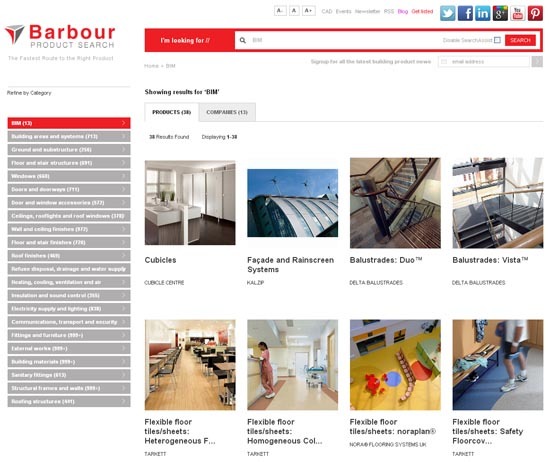 As part of our continual drive to improve Barbour Product Searchs search functionality and navigation, we have recently enhanced our search engine and intuitive product category listing so we can now add your BIM objects to your profile, enabling specifiers to easily search, browse and download them. Specifiers can either type BIM as a keyword in the search box at the top of each page, or click on the BIM category from the category list on the left hand side of each page. They can then explore the products and companies shown, and click-through to download their chosen BIM objects. A major benefit of having your BIM objects hosted on your profile is for increased exposure to specifiers across the full purchasing chain, enhancing the opportunity for them to be found and embedded into a project's plans. If you already have BIM objects and they dont currently appear on your profile, please email us at [email protected] and we can arrange for them to be added. For more information about how we can help you get BIM ready please email [email protected] or call us on 0151 353 3531.